Just like the movies here, these movies are from the same set of simulations of individual galaxies forming, starting at a time when the Universe was just a a few million years old (redshift of 100). 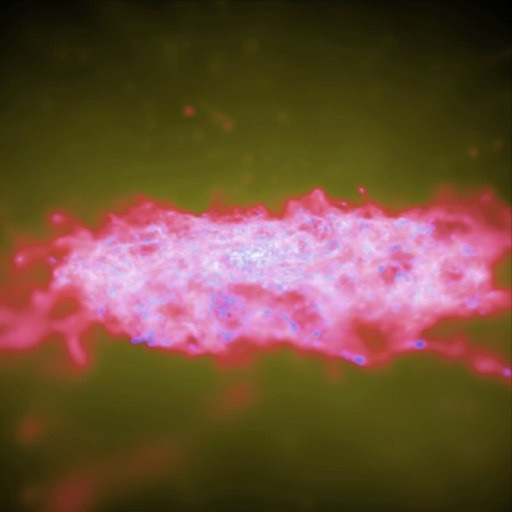 They follow the region that will become a single galaxy by the present time, tracing the evolution of dark matter and gas, which eventually turns into stars. Those stars then ‘light up’ the medium around them: they alter it with both their radiation heating up and pushing on the medium, as well as supernova explosions. 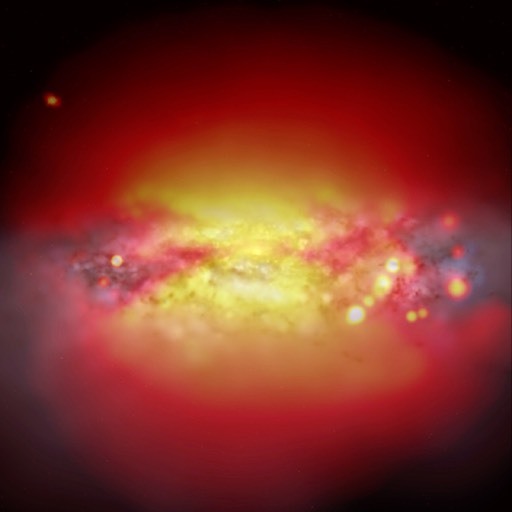 All of these simulations focus on one of our FIRE results, the galaxy called “m12i” in the FIRE papers. This is the closest in mass to our own, Milky Way galaxy, and it forms a disk which in most observable respects closely resembles our own galaxy. 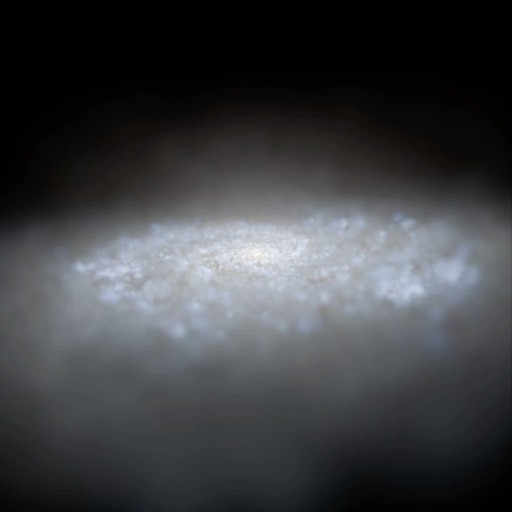 We’ve taken the simulation results at redshift zero (present-day times), and flown a camera “through” the resulting galaxy, panning around it as well, so you can see the structure inside the system. Remember, we want to emphasize that everything here is the prediction of a simulation that started at very high redshifts as just a cloud of gas and dark matter. 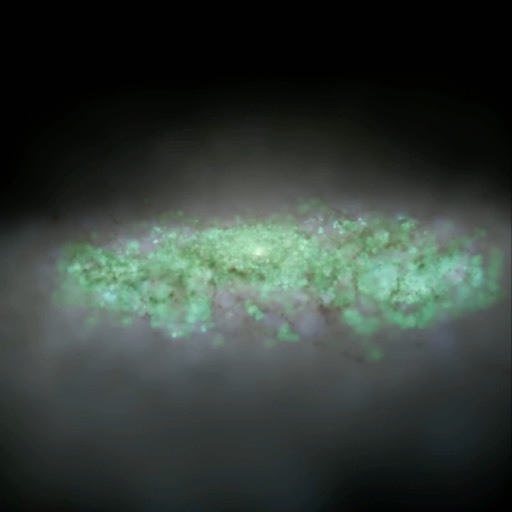 This shows a mock three-color image (u/g/r bands) of what this galaxy would look like in visible light wavelengths, if there were no gas and dust in the galaxy to absorb any of the light. 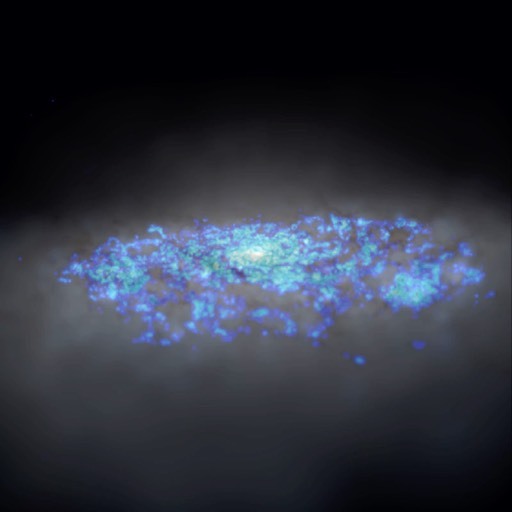 This shows the gas in the galaxy. Blue is cold molecular/atomic gas (T<1000 K), the stuff that forms stars. Pink is warm ionized gas (10^4-10^5 K), most of the stuff cooling onto a galaxy. And yellow is ‘hot‘ gas (>10^6 K), making up the galaxy halo. We don’t actually get to “see” the gas all at once. What we see is emission from different tracers. Here, the movie shows the un-obscured starlight (as above), but over-laid on it, in blue, we map the emission from CO molecules. This traces the cold, dense gas out of which stars will form. The movie above again shows the “background” of un-obscured starlight, with the pink layer showing the instantaneous rate of formation of new stars in the gas. You can see it closely traces where the CO emission is coming from. We often measure star formation by looking for the emission from young, massive stars, that ionize gas around them, which in turn re-combines and emits H-alpha photons. The green layer here shows the H-alpha emission. This broadly traces the star formation, but with more diffuse bubbles in some regions where are large region can be ionized by some young, but not super-young, stars. This overlays the emission that would be observed in X-rays (integrated from 0.5-10 keV), on top of the unobscured starlight. The X-rays primarily come from shock-heated gas in the halo surrounding the galaxy and in bubbles around individual supernovae. Note the hot center and very extended, diffuse “halo” of gas surrounding.